Does Boppin Bugz Really Work? Every once in awhile a new toy comes along that really wows the kids. It soon becomes the must have toy. They all seem to like something different and this is the category that the Boppin Bugz just might fall into. Boppin Bugz looks just like a little robot. It certainly wouldn’t win any blue ribbons for being the best looking toy, but it has all of the makings of becoming a big hit with the kids. Basically it looks like a robot bug. The kids have to continuously and quickly “bop” it on its back to charge it up. Once they do this the bug takes off but when the kids go to catch it the Boppin Bugz has built in sensors that detects this so it takes off to avoid getting caught. The promoters of Boppin Bugz claim that this toy has three different sensor modes built into it. It also makes some nifty sounds, moves around like crazy and has flashing lights. The hype for the Boppin Bugz really is all the activity that it is capable of. It never moves the same way twice so it creates a new chase experience each time the kids use it. The cost of the Boppin Bugz is $10 Which is not bad for a toy that can do as much as this. Plus, you get 50% off a second one if you are buying two. The commitment for the Boppin Bugz on your part will be to step away and let the kids do the playing. At first the kids may be a little lost as to what the whole concept behind the Boppin Bugz is. The idea is for the kids to bop the Boppin Bugz to energerize it as much as they can, then try to catch it or hold races against other Boppin Bugz. While this is a fun toy for a youngster to play with on their own, there is a whole lot more fun when they are playing with others who have a Boppin Bugz. There is every indication that the Boppin Bugz could just be one of those toys where soon almost every youngster has one or at least wants one. There are three different models of Boppin Bugz to choose from. There is Connie the Cockroach, Cedric the Centipede or Guy the Fly. They are bright and colorful and when the kids want to stop their Boppin Bugz they just catch it so they can bop it. The sound effects are really cool and there is three different play modes the kids can enjoy so they are not too likely to become bored with it any time soon. We are prepared to give the Boppin Bugz a thumbs up. It certainly is affordable, and it is a toy that is designed to get the kids moving. It will surely keep them entertained and with the price being so reasonable you can afford to buy them all three, so there you have three different gift buying occasions covered. 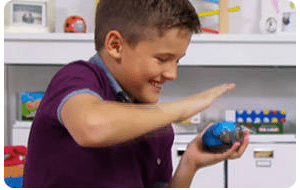 If your kids are into the robot style toys then one that you may want to check out is Wonder Workshop Dash Robot. What do you think? Does Boppin Bugz work or not? Do Looney Balloons Really Work? Does the Compose Yourself Music Card Game Really Work?